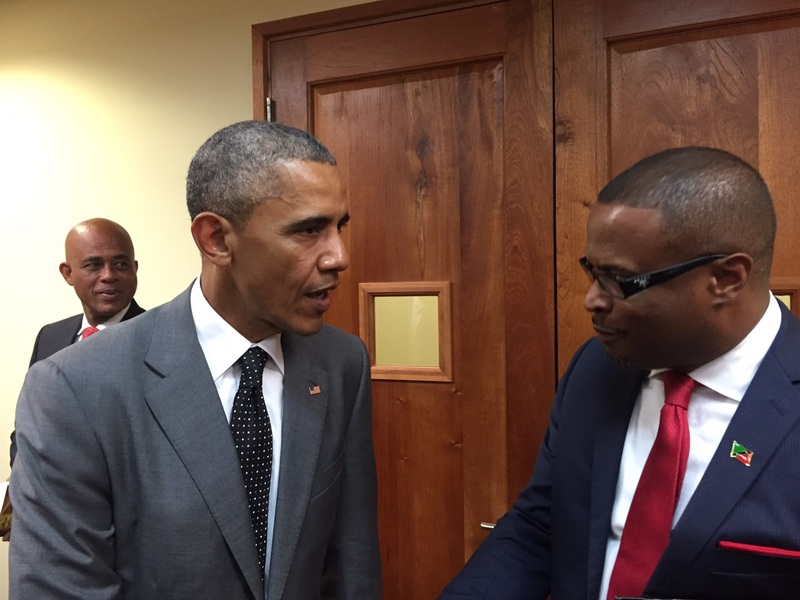 NIA CHARLESTOWN NEVIS (APRIL 10, 2015) –Minister of Foreign Affairs and Deputy Premier of Nevis Hon. Mark Brantley described the just concluded US-CARICOM (Caribbean Community) Summit in Jamaica as an excellent meeting which lay the platform for closer dialogue with the Caribbean’s largest neighbour, the United States of America. Mr. Brantley made the comment when he spoke to the Department of Information on April 10, 2015, as part of a delegation headed by Prime Minister Hon. Dr. Timothy Harris. He noted that Dr. Harris made a timely intervention which indicated the need for an established mechanism that would ensure greater dialogue and a more effective way of implementing decisions taken to certify that the actions taken and the benefits from those actions would be for the peoples of the Caribbean. Mr. Brantley noted that the meeting focused on competitiveness, security and alternative energy and other CARICOM Heads were also able to make presentations or interventions. He noted that President Barack Obama used the opportunity at the historic summit to announce two new initiatives in relation to energy – the establishment of an energy fund and the establishment of a US-CARICOM task force on energy. Meantime, the Foreign Affairs Minister of St. Kitts and Nevis, stated that the issue of Venezuela was also discussed at the forum with President Obama and expressed satisfaction on the manner in which the issue was dealt with from the Federation’s perspective. “We are satisfied that the position taken by St. Kitts and Nevis, which is that both the United States of America and the Bolivian Republic of Venezuela are our friends and that we value that friendship and as a consequence, we call on them both to engage in dialogue to resolve the differences that might have arisen and that was vindicated in terms of the comments made by president Obama himself. “We are happy with those comments. We feel that there will be dialogue. The dialogue in fact has already started and we, therefore, look forward to that dialogue continuing as we promote of course, peace and prosperity throughout the entire region.We are quite happy with what we are hearing and we trust and hope that the parties can continue and we in St. Kitts and the wider Caribbean, make ourselves available, if necessary, to mediate between these two parties, friends and to ensure that we maintain the peace and security of the region,” he said. The Foreign Affairs Minister said the delegation hoped to have very close discussions with partners in Latin America and the Caribbean. He said there were many issues on the agenda for discussion and expressed hope that they would be able to have bilateral meetings on the side lines of the historic summit in Panama, in which Cuba would be participating for the first time, and hoped to have tangible results from that meeting.